VMD is a molecular graphics program designed for the display and analysis of molecular assemblies, in particular biopolymers such as proteins and nucleic acids. VMD can simultaneously display any number of structures using a wide variety of rendering styles and coloring methods. Molecules are displayed as one or more `representations', where each representation embodies a particular rendering method and coloring scheme for a selected subset of atoms. The atoms displayed in each representation are chosen using an extensive atom selection syntax, which includes boolean operators and regular expressions. VMD provides a complete graphical user interface for program control, as well as a text interface using the Tcl embeddable parser to allow for complex scripts with variable substitution, control loops, and function calls. Full session logging is supported, which produces a VMD command script for later playback. High-resolution raster images of displayed molecules may be produced by generating input scripts for use by a number of photorealistic image processing applications. VMD has also been expressly designed with the ability to animate molecular dynamics (MD) simulation trajectories, imported either from files or from a direct connection to a running MD simulation. VMD is the visualization component of MDScope, a set of tools for interactive problem solving in structural biology, which also includes the parallel MD program NAMD, and the MDCOMM software used to connect the visualization and simulation programs. VMD is written in C++, using an object-oriented design; the program, including source code and extensive documentation, is freely available via anonymous ftp and through the World Wide Web. NAMD2: Greater scalability for parallel molecular dynamics. Laxmikant Kalé, Robert Skeel, Milind Bhandarkar, Robert Brunner, Attila Gursoy, Neal Krawetz, James Phillips, Aritomo Shinozaki, Krishnan Varadarajan, and Klaus Schulten. Journal of Computational Physics, 151:283-312, 1999. "Neural gas" for vector quantization and its application to time-series prediction. Thomas M. Martinetz, Stanislav G. Berkovich, and Klaus Schulten. IEEE Transactions on Neural Networks, 4:558-569, 1993. As a data compression technique, vector quantization requires the minimalization of a cost function - the distortion error - which, in general, has many local minima. In this paper, a neural network algorithm based on a "soft-max" adaptation rule is presented that exhibits good performance in reaching the optimum, or at least coming close. The soft-max rule employed is an extension of the standard K-means clustering procedure and takes into account a "neighborhood ranking" of the reference (weight) vectors. It is shown that the dynamics of the reference (weight) vectors during the input-driven adaptation procedure 1) is determined by the gradient of an energy function whose shape can be modulated through a neighborhood determining parameter, and 2) resembles the dynamics of Brownian particles moving in a potential determined by the data point density. The network is employed to represent the attractor of the Mackey-Glass equation and to predict the Mackey-Glass time series, with additional local linear mappings for generating output values. The results obtained for the time-series prediction compare very favorably with the results achieved by back-propagation and radial basis function networks. Molecular biomimetics: nanotechnology through biology. Mehmet Sarikaya, Candan Tamerler, Alex K. -Y. Jen, Klaus Schulten, and François Baneyx. Nature Materials, 2:577-585, 2003. 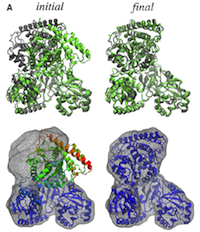 The crystal structure of the light harvesting complex II (B800-850) from Rhodospirillum molischianum. Juergen Koepke, Xiche Hu, Cornelia Muenke, Klaus Schulten, and Hartmut Michel. Structure, 4:581-597, 1996. In photosynthesis light is absorbed by light-harvesting antenna complexes (LHs) and its energy is transferred to the photosynthetic reaction center. In purple photosynthetic bacteria and higher plants the LHs are integral membrane protein/pigment complexes. LH-II from the purple bacterium Rhodospirillum molischianum is an octamer of heterodimers, the later consisting of two polypeptides, the and -apoproteins, noncovalently binding three bacteriochlorophyll-a (BChl-a) molecules and at least one lycopene molecule as an additional chromophore. LH-II absorbs light and converts it into a BChl-a exciton, which is then transferred to the photosynthetic reaction center through the core light harvesting complex LH-I. The crystal structure of LH-II from Rhodospirillum molischianum has been determined by molecular replacement at 2.4 Åresolution using X-ray diffraction. The search model for molecular replacement was a computationally modelled octamer of heterodimer of a nonameric LH-II from Rps. acidophila. The crystal structure displays two concentric cylinders of membrane-spanning helical protein subunits with the -apoprotein at the inner and the -apoprotein at the outer side. Sixteen BChl-a molecules absorbing maximally at 846 nm (B850), oriented perpendicular to the plane of the membrane and sandwiched between the helical apoproteins, form a ring of radius 23.0 Å. The other eight BChl-a molecules absorbing maximally at 800nm (B800) situated between the -apoproteins and bound through their central Mg atoms to an aspartate ( -Asp6), form a concentric ring of radius 28.8 Å. Eight membrane spanning lycopene pigments, held in place through aromatic side groups, stretch out between the B800 and B850 BChl-a's. The light-harvesting complexes from different bacteria assume various ring sizes. In LH-II of Rs. molischianum, the transition dipole moments of neighboring B850 and B800 BChl-a's are nearly parallel to each other, i.e., are optimally aligned for Forster exciton transfer; Dexter energy transfer is possible through B850 BChl-a's are in van der Waals distance to a lycopene, such that singlet and triplet energy transfer between lycopene and the BChl-a's is optimal for light energy transfer in that it samples all spatial absorption and emission characteristics as well as places all oscillator strength into energetically low lying, thermally accessible exciton states. Textbook: Neural Computation and Self-Organizing Maps: An Introduction. Helge Ritter, Thomas Martinetz, and Klaus Schulten. Addison-Wesley, New York, revised English edition, 1992. This book is a comprehensive introduction to neural networks and neural information processing. It describes the most important models of neural networks and how they contribute to our understanding of information and organization processes in the brain. One of the few generally recognized organizational principles of the nervous system, the development of cortical feature maps (brain maps), is described in detail, and the reader is introduced to the biological background and the mathematical properties of self-organizing maps as important functional building blocks of the brain. Examples show how neural networks can solve important information processing tasks, including the development of sensory maps, the traveling salesman problem, and visuomotor control of robots. Topology representing networks. Thomas Martinetz and Klaus Schulten. Neural Networks, 7:507-522, 1994. A Hebbian adaptation rule with winner-take-all like competition is introduced. It is shown that this competitive Hebbian rule forms so-called Delaunay triangulations, which play an important role in computational geometry for efficiently solving proximity problems. Given a set of neural units i, i = 1, ..., N, the synaptic weights of which can be interpreted as pointers , i = 1, ..., N in , the competitive Hebbian rule leads to a connectivity structure between the units i that corresponds to the Delaunay triangulation of the set of pointers w . Such competitive Hebbian rule develops connections ( > 0) between neural units i, j with neighboring receptive fields (Voronoi polygons) , , whereas between all other units i, j no connections evolve ( = 0). Combined with a procedure that distributes the pointers over a given feature manifold M, for example, a submanifold M , the competitive Hebbian rule provides a novel approach to the problem of constructing topology preserving feature maps and representing intricately structured manifolds. The competitive Hebbian rule connects only neural units, the receptive fields (Voronoi polygons) , of which are adjacent on the given manifold M. This leads to a connectivity structure that defines a perfectly topology preserving map and forms a discrete, path preserving representation of M, also in cases where M has an intricate topology. This makes this novel approach particularly useful in all applications where neighborhood relations have to be exploited or the shape and topology of submanifolds have to be taken into account. A neural network algorithm for vector quantization of topologically arbitrarily structured manifolds of input signals is presented and applied to a data manifold M which consists of subsets of different dimensionalities. In addition to the quantization of M each neural unit i, i + 1, ..., N of the network A develops connections, described by 0,1, to those neural units j with adjacent receptive fields. The resulting connectivity matrix describes asymptotically the neighborhood relationships among the input data of the quantized manifold and defines a graph which reflects the often a priori unknown dimensionality and topological structure of the data manifold M.
Control of the selectivity of the aquaporin water channel family by global orientational tuning. Emad Tajkhorshid, Peter Nollert, Morten Ø. Jensen, Larry J. W. Miercke, Joseph O'Connell, Robert M. Stroud, and Klaus Schulten. Science, 296:525-530, 2002. Aquaporins are transmembrane channels found in cell membranes of all life forms. We examine their apparently paradoxical property, facilitation of efficient permeation of water while excluding protons, which is of critical importance to preserving the electrochemical potential across the cell membrane. We have determined the structure of the Escherichia coli aquaglyceroporin GlpF with bound water, in native (2.7 angstroms) and in W48F/F200T mutant (2.1 angstroms) forms, and carried out 12-nanosecond molecular dynamics simulations that define the spatial and temporal probability distribution and orientation of a single file of seven to nine water molecules inside the channel. Two conserved asparagines force a central water molecule to serve strictly as a hydrogen bond donor to its neighboring water molecules. Assisted by the electrostatic potential generated by two half-membrane spanning loops, this dictates opposite orientations of water molecules in the two halves of the channel, and thus prevents the formation of a "proton wire," while permitting rapid water diffusion. Both simulations and observations revealed a more regular distribution of channel water and an increased water permeability for the W48F/F200T mutant. Mechanical unfolding intermediates in titin modules. Piotr E. Marszalek, Hui Lu, Hongbin Li, Mariano Carrion-Vazquez, Andres F. Oberhauser, Klaus Schulten, and Julio M. Fernandez. Nature, 402:100-103, 1999. The modular protein titin, which is responsible for the passive elasticity of muscle, is subjected to stretching forces. Previous work on the experimental elongation of single titin molecules has suggested that force causes consecutive unfolding of each domain in an all-or-none fashion . To avoid problems associated with the heterogeneity of the modular, naturally occurring titin, we engineered single proteins to have multiple copies of single immunoglobulin domains of human cardiac titin Here we report the elongation of these molecules using the atomic force microscope. We find an abrupt extension of each domain by before the first unfolding event. This fast initial extension before a full unfolding event produces a reversible `unfolding intermediate'. Steered molecular dynamics simulations show that the rupture of a pair of hydrogen bonds near the amino terminus of the protein domain causes an extension of about , which is in good agreement with our observations. Disruption of these hydrogen bonds by site-directed mutagenesis eliminates the unfolding intermediate. The unfolding intermediate extends titin domains by percent of their slack length, and is therefore likely to be an important previously unrecognized component of titin elasticity. Atomic force microscopy of single molecules, steered molecular dynamics, and the theory of stochastic processes have established a new field that investigates mechanical functions of proteins such as ligand - receptor binding/unbinding and elasticity of muscle proteins during stretching. The combination of these methods yields information on the energy landscape that controls mechanical function and on the force bearing components of proteins, as well as on the underlying physical mechanisms. Molecular Dynamics Study of Unbinding of the Avidin-Biotin Complex Sergei Izrailev, Sergey Stepaniants, Manel Balsera, Yoshi Oono, and Klaus Schulten. Biophysical Journal, 72:1568-1581, 1997. We report molecular dynamics simulations which induce, over periods of 40-500 ps, the unbinding of biotin from avidin by means of external harmonic forces with force constraints close to those of AFM cantilevers. The applied forces are sufficiently large to reduce the overall binding energy enough to yield unbinding within the measurement time. Our study complements earlier work on biotin-streptavidin that employed a much larger harmonic force constant. 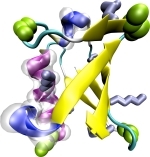 The simulations reveal a variety of unbinding pathways, the role of key residues contributing to adhesion as well as the spatial range over which avidin binds biotin. In contrast to the previous studies, the calculated rupture forces exceed by far those observed. We demonstrate, in the framework of models expressed in terms of one-dimensional Langevin equations with a schematic binding potential, the associated Smoluchowski equations, and the theory of first passage times, that picosecond to nanosecond simulation of ligand unbinding requires such strong forces that the resulting protein-ligand motion proceeds far from the thermally activated regime of millisecond AFM experiments, and that simulated unbinding cannot be readily extrapolated to the experimentally observed rupture. 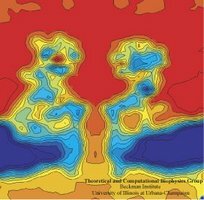 Molecular mechanics simulations offer a computational approach to studying the behavior of biomolecules at atomic detail, but such simulations are limited in size and timescale by available computing resources. State-of-the-art graphics processing units (GPUs) can perform over 500 billion arithmetic operations per second, a tremendous computational resource which can now be utilized for general purpose computing as a result of recent advances in GPU hardware and software architecture. In this paper, an overview of recent advances in programmable GPUs is presented, with an emphasis on their application to molecular mechanics simulations and the programming techniques required to obtain optimal performance in these cases. We demonstrate the use of GPUs for the calculation of long-range electrostatics and nonbonded forces for molecular dynamics simulations, where GPU-based calculations are typically 10-100 times faster than heavily optimized CPU-based implementations. The application of GPU acceleration to biomolecular simulation is also demonstrated through the use of GPU-accelerated Coulomb-based ion placement and calculation of time-averaged potentials from molecular dynamics trajectories. A novel approximation to Coulomb potential calculation, the multilevel summation method, is introduced and compared to direct Coulomb summation. In light of the performance obtained for this set of calculations, future applications of graphics processors to molecular dynamics simulations are discussed. Unfolding of titin immunoglobulin domains by steered molecular dynamics simulation. Hui Lu, Barry Isralewitz, André Krammer, Viola Vogel, and Klaus Schulten. 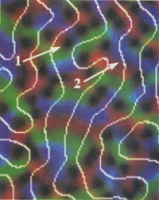 Biophysical Journal, 75:662-671, 1998. Titin, a 1 m long protein found in striated muscle myofibrils, possesses unique elastic and extensibility properties in its I-band region, which is largely composed of 7-strand -sandwich immunoglobulin-like (Ig) domains. The behavior of titin as a hysteretical, multi-stage entropic spring has been shown in atomic force microscope and optical tweezer experiments to depend on the reversible unfolding of individual Ig domains. We performed steered molecular dynamics simulations to stretch single titin Ig domains in solution with pulling speeds of 0.5 and 1.0 /ps. Resulting force-extension profiles exhibit a single dominant peak for each Ig domain unfolding, consistent with the experimentally observed sequential, as opposed to concerted, unfolding of Ig domains. This force peak can be attributed to an initial burst of backbone hydrogen bonds, which takes place between -strands A and B in between -strands A' and G. Additional features of the simulations, including the position of the force peak and relative unfolding resistance of different Ig domains, can be related to experimental observations. First passage time approach to diffusion controlled reactions. Attila Szabo, Klaus Schulten, and Zan Schulten. Journal of Chemical Physics, 72:4350-4357, 1980. Association reactions involving diffusion in one, two, and three-dimensional finite domains governed by Smoluchowski-type equations (e.g., interchain reaction of macromolecules, ligand binding to receptors, repressor-operator association of DNA strand) are shown to be often well described by first-order kinetics and characterized by an average reaction (passage) time . An inhomogeneous differential equation is derived which,for problems with high symmetry, yields by simple quadrature without taking recourse to detailed cumbersome time-dependent solutions of the original Smoluchowski equation. The cases of diffusion and nondiffusion controlled processes are included in the treatment. For reaction processes involving free diffusion and intramolecular chain motion, the validity of the passage time approximation is analyzed. Molecular dynamics simulation of a bilayer of 200 lipids in the gel and in the liquid crystal-phases. Helmut Heller, Michael Schaefer, and Klaus Schulten. Journal of Physical Chemistry, 97:8343-8360, 1993. We have constructed and simulated a membrane-water system which consists of 200 molecules of 1-palmitoyl-2-oleoyl-sn-glycero-3-phosphatidylcholine forming a rectangular patch of a bilayer and of 5483 water molecules covering the head groups on each side of the bilayer. The total number of atoms is approximately 27 000. The lateral dimensions of the bilayer are 85 A 100 A, and the distance between the bilayer surfaces as given by the average phosphorus to phosphorus distance is 35 A. The thickness of each water layer is up to 15 A. In all, we simulated 263 ps of the dynamics of the system. To prevent system disintegration, atoms within 5 A from the surface were harmonically restrained and treated by Langevin dynamics, forming a stochastic boundary. Interior lipids and water molecules were unrestrained. The first 120 ps of the dynamics calculation were used to equilibrate the system and to achieve a low internal pressure. We performed two simulations for analysis: simulation I of the system that resulted from the equilibration: simulation II of the system after an increase of the area per head group from 46 to 70 . The decrease of the lateral lipid density was achieved by scaling the atomic x-, y-, and z-coordinates independently, leaving the volume of the system constant. For both simulations, I and II, we determined the internal pressure, the lipid self-diffusion coefficients, the order parameter profile, the distribution of molecular groups, and other properties. The parameters extracted from simulation II are in good agreement with observations on bilayers in the liquid-crystal phase. We provide evidence that the bilayer of simulation I corresponds to the gel phase. The membrane structures resulting from this work can be used for molecular dynamics investigations of membrane proteins, e.g., for the study of lipid-protein interactions or for the equilibration of structural models. Calculating potentials of mean force from steered molecular dynamics simulations. Sanghyun Park and Klaus Schulten. Journal of Chemical Physics, 120:5946-5961, 2004. Free energy calculation from steered molecular dynamics simulations using Jarzynski's equality.Sanghyun Park, Fatemeh Khalili-Araghi, Emad Tajkhorshid, and Klaus Schulten. Journal of Chemical Physics, 119:3559-3566, 2003. Electronic excitations in finite and infinite polyenes. Paul Tavan and Klaus Schulten. Physical Review B, 36:4337-4358, 1987. We study electronic excitations in long polyenes, i.e., in one-dimensional strongly correlated electron systems which are neither infinite nor small. The excitations are described within Hubbard and Pariser-Parr-Pople (PPP) models by means of a multiple-reference double-excitation expansion [P. Tavan and K. Schulten, J. Chem. Phys. 85, 6602 (1986)]. We find that quantized "transition" momenta can be assigned to electronic excitations in finite chains. These momenta link excitation energies of finite chains to dispersion relations of infinite chains, i.e., they bridge the gap between finite and infinite systems. A key result is the following: Excitation energies E in polyenes with N carbon atoms are described very accurately by the formula , where denotes the excitation class, the energy gap in the infinite system [ ], and k(N) the elementary transition momentum. The parameters and are determined for covalent and ionic excitations in alternating and nonalternating polyenes. The covalent excitations are combinations of triplet excitations T, i.e., T, TT, TTT, ... . The lowest singlet excitations in the infinite polyene, e.g., in polyacetylene or polydiacetylene, are TT states. Available evidence proves that these states can dissociate into separate triplets. The bond structure of TT states is that of a neutral soliton-antisoliton pair. The level density of TT states in long polyenes is high enough to allow dissociation into separate solitons. Linear polyene electronic structure and potential surfaces. Bruce S. Hudson, Bryan E. Kohler, and Klaus Schulten. In Edward C. Lim, editor, Excited States, volume 6, pp. 1-95. Academic Press, New York, 1982. Polyenes are linear conjugated chains of carbon atoms joined by alternating double and single bonds and are deservedly the objects of a good deal of experimental and theoretical attention. There are many reasons for this, including the historical importance of these systems in the development of molecular quantum theory, the fundamental importance of cis-trans photoisomerization, which is the distinctive photochemistry of these molecules, and the fact that polyene chromophores play starring roles in biologically important photoprocesses, such as vision and energy production in the purple-membrane Halobacterium halobium. In both of these biological examples, the electronic structure of teh polyene and how it changes upon excitation is of key importance. Until relatively recently, this structure was thought to be rather simple, similar to that of other conjugated systems such as the polyacenes, and well described by approximate molecular orbital ideas. Recent experiments and theoretical discoveries have revealed that this is not the case: Polyene electronic structure is both more complicated and more interesting than was previously thought. Self-organizing maps: Ordering, convergence properties and energy functions. Edgar Erwin, Klaus Obermayer, and Klaus Schulten. Biological Cybernetics, 67:47-55, 1992. We investigate the convergence properties of the self-organizing feature map algorithm for a simple, but very instructive case: the formation of a topographic representation of the unit interval [0,1] by a linear chain of neurons. We extend the proofs of convergence of Kohonen and of Cottrell and Fort to hold in any case where the neighborhood function, which is used to scale the change in the weight values at each neuron, is a monotonically decreasing function of distance from the winner neuron. We prove that the learning dynamics cannot be described by a gradient descent on a single energy function, but may be described using a set of potential functions, one for each neuron, which are independently minimized following a stochastic gradient descent. We derive the correct potential functions for the one- and multi-dimensional case, and show that the energy functions given by Tolat (1990) are an approximation which is no longer valid in the case of highly disordered maps or steep neighborhood functions. NAMD - A parallel, object-oriented molecular dynamics program. Mark Nelson, William Humphrey, Attila Gursoy, Andrew Dalke, Laxmikant Kalé,Robert D. Skeel, and Klaus Schulten. International Journal of Supercomputer Applications and High Performance Computing, 10:251-268, 1996. NAMD is a molecular dynamics program designed for high performance simulations of large biomolecular systems on parallel computers. An object-oriented design implemented using C++ facilitates the incorporation of new algorithms into the program. NAMD uses spatial decomposition coupled with a multithreaded, message-driven design which is shown to scale efficiently to multiple processors. Also, NAMD incorporates the Distributed Parallel Multipole Tree Algorithm for computation of full electrostatic force evaluation in O(N) time. NAMD can be connected via a communication system to a molecular graphics program in order to provide an interactive modeling tool for viewing and modifying a running simulation. The application of NAMD to a protein-DNA -water complex of more 36,000 atoms illustrates the performance of NAMD. Single-molecule force experiments in vitro enable the characterization of the mechanical response of biological matter at the nanometer scale. However, they do not reveal the molecular mechanisms underlying mechanical function. These can only be readily studied through molecular dynamics simulations of atomic structural models: 'in silico' (by computer analysis) single-molecule experiments. Steered molecular dynamics simulations, in which external forces are used to explore the response and function of macromolecules, have become a powerful tool complementing and guiding in vitro single-molecule experiments. 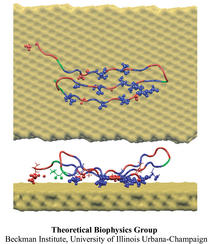 The insights provided by in silico experiments are illustrated here through a review of recent research in three areas of protein mechanics: elasticity of the muscle protein titin and the extracellular matrix protein fibronectin; linker-mediated elasticity of the cytoskeleton protein spectrin; and elasticity of ankyrin repeats, a protein module found ubiquitously in cells but with an as-yet unclear function. On the origin of a low-lying forbidden transition in polyenes and related molecules. Klaus Schulten and Martin Karplus. Chemical Physics Letters, 14:305-309, 1972. It is demonstrated that the inclusion of double-excited configurations in semi-empirical and a priori calculations of polyenes leads to a significant alteration of the spectrum. In agreement with the recent experiment of Hudson and Kohler, a forbidden ( ) state appears below the strongly allowed ( ) state. Convergence properties of Kohonen's topology conserving maps: Fluctuations, stability and dimension selection. Helge Ritter and Klaus Schulten. Biological Cybernetics, 60:59-71, 1988. 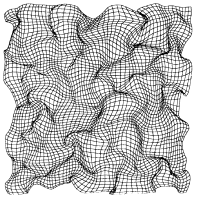 We analyse a Markovian algorithm for the formation of topologically correct feature maps proposed earlier by Kohonen. The maps from a space of input signals onto an array of formal neurons are generated by a learning scheme driven by a random sequence of input samples. The learning is described by an equivalent Fokker-Planck equation. Convergence to an equilibrium map can be ensured by a criterion for the time dependence of the learning step size. We investigate the stability of the equilibrium map and calculate the fluctuations around it. We also study an instability responsible for a phenomenon termed by Kohonen "automatic selection of feature dimensions". Flexible fitting of atomic structures into electron microscopy maps using molecular dynamics. Leonardo G. Trabuco, Elizabeth Villa, Kakoli Mitra, Joachim Frank, and Klaus Schulten. Structure, 16:673-683, 2008. 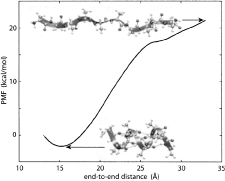 Correlation effects in the spectra of polyenes. Klaus Schulten, I. Ohmine, and Martin Karplus. Journal of Chemical Physics, 64:4422-4441, 1976. -Hemolysin of Staphylococcus aureus is a self-assembling toxin that forms a water-filled transmembrane channel upon oligomerization in a lipid membrane. Apart from being one of the best-studied toxins of bacterial origin, -hemolysin is the principal component in several biotechnological applications, including systems for controlled delivery of small solutes across lipid membranes, stochastic sensors for small solutes, and an alternative to conventional technology for DNA sequencing. 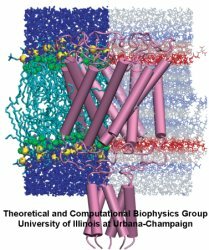 Through large-scale molecular dynamics simulations, we studied the permeability of the - hemolysin/lipid bilayer complex for water and ions. 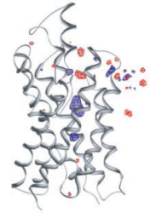 The studied system, composed of about 300,000 atoms, included one copy of the protein, a patch of a DPPC lipid bilayer, and a 1 M water solution of KCl. Monitoring the fluctuations of the pore structure revealed an asymmetric, on average, cross section of the -hemolysin stem. 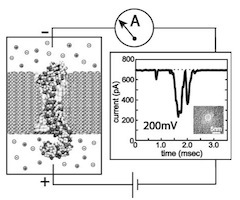 Applying external electrostatic fields produced a transmembrane ionic current; repeating simulations at several voltage biases yielded a current/voltage curve of - hemolysin and a set of electrostatic potential maps. The selectivity of -hemolysin to Cl was found to depend on the direction and the magnitude of the applied voltage bias. The results of our simulations are in excellent quantitative agreement with available experimental data. Analyzing trajectories of all water molecule, we computed the -hemolysin's osmotic permeability for water as well as its electroosmotic effect, and characterized the permeability of its seven side channels. 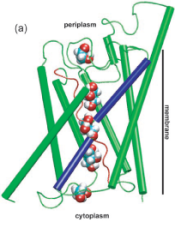 The side channels were found to connect seven His-144 residues surrounding the stem of the protein to the bulk solution; the protonation of these residues was observed to affect the ion conductance, suggesting the seven His-144 to comprise the pH sensor that gates conductance of the -hemolysin channel. Photosynthetic organisms fuel their metabolism with light energy and have developed for this purpose an efficient apparatus for harvesting sunlight. The atomic structure of the apparatus, as it evolved in purple bacteria, has been constructed through a combination of X-ray crystallography, electron microscopy, and modeling. The detailed structure and overall architecture reveals a hierarchical aggregate of pigments that utilizes, as shown through femtosecond spectroscopy and quantum physics, elegant and efficient mechanisms for primary light absorption and transfer of electronic excitation towards the photosynthetic reaction center. Generalized Verlet algorithm for efficient molecular dynamics simulations with long-range interactions. Helmut Grubmüller, Helmut Heller, Andreas Windemuth, and Klaus Schulten. 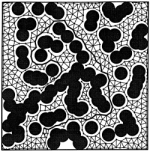 Molecular Simulation, 6:121-142, 1991. For the purpose of molecular dynamics simulations of large biopolymers we have developed a new method to accelerate the calculation of long-range pair interactions (e.g. Coulomb interaction). The algorithm introduces distance classes to schedule updates of non-bonding interactions and to avoid unnecessary computations of interactions between particles which are far apart. To minimize the error caused by the updating schedule, the Verlet integration scheme has been modified. The results of the method are compared to those of other approximation schemes as well as to results obtained by numerical integration without approximation. For simulation of a protein with 12 637 atoms our approximation scheme yields a reduction of computer time by a factor of seven. The approximation suggested can be implemented on sequential as well as on parallel computers. We describe an implementation on a (Transputer-based) MIMD machine with a systolic ring architecture. This work presents an all-atom molecular dynamics simulation of a complete virus, the satellite tobacco mosaic virus. Simulations with up to 1 million atoms for over 50 ns demonstrate the stability of the whole virion and of the RNA core alone, while the capsid without RNA exhibits a pronounced instability. Physical properties of the simulated virus particle including electrostatic potential, radial distribution of viral components, and patterns of correlated motion are analyzed and the implications for the assembly and infection mechanism of the virus are discussed. On the stationary state of Kohonen's self-organizing sensory mapping. Helge Ritter and Klaus Schulten. Biological Cybernetics, 54:99-106, 1986. The stationary state of the self-organizing sensory mappings of Kohonen is investigated. For this purpose the equation for the stationary state is derived for the case of one-dimensional and two-dimensional mappings. The equation can be solved for special cases, including the general one-dimensional case, to yield an explicit expression for the local magnification factor of the map. Photosynthetic apparatus of purple bacteria. Xiche Hu, Thorsten Ritz, Ana Damjanovic, Felix Autenrieth, and Klaus Schulten. Quarterly Reviews of Biophysics, 35:1-62, 2002. This article reviews work accomplished during the past decade on the structure and function of the photosynthetic unit of purple bacteria with a main focus on the light harvesting component. The photosynthetic unit exists as aggregates of proteins in the intracellular membranes of these bacteria; the units absorb sun light and utilize its energy for the synthesis of ATP. The light harvesting component involves ring-shape proteins that surround directly in the form of satellite rings the so-called reaction center. The structure of the proteins as established through a combination of experimental and computational methods is reviewed. The proteins provide a scaffold for a hierarchical aggregate of chlorophylls and carotenoids that funnel electronic excitation towards the reaction center. The physics of this process is reviewed in detail. Finally, the genomic level organization of the light harvesting system is summarized. We investigate the application of an extension of Kohonen's self-organizing mapping algorithm to the learning of visuo-motor-coordination of a simulated robot arm. We show that both arm kinematics and arm dynamics can be learned, if a suitable representation for the map output is used. Due to the topology-conserving property of the map spatially neighboring neurons can learn cooperatively, which greatly improves the robustness and the convergence properties of the algorithm. Human immunodeficiency virus type 1 (HIV-1) is the major cause of AIDS, for which treatments need to be developed continuously as the virus becomes quickly resistant to new drugs. When the virus infects a human cell it releases into the cell its capsid, a closed, stable container protecting the viral genetic material. However, interaction with the cell triggers at some point an instability of the capsid, leading to a well timed release of the genetic material that merges then with the cell's genes and begins to control the cell. The dual role of the capsid, to be functionally both stable and unstable, makes it in principle an ideal target for antiviral drugs and, in fact, treatments of other viral infections successfully target the respective capsids. The size of the HIV-1 capsid (about 1,300 proteins), and its irregular shape had prevented so far the resolution of a full capsid atomic-level structure. However, in a tour de force effort, groups of experimental and computational scientists have now resolved the capsid's chemical structure (deposited to the protein data bank under the accession codes 3J3Q and 3J3Y). The discovery can guide now the design of novel drugs for enhanced antiviral therapy. Energetics of glycerol conduction through aquaglyceroporin GlpF. Morten Ø. Jensen, Sanghyun Park, Emad Tajkhorshid, and Klaus Schulten. Proceedings of the National Academy of Sciences, USA, 99:6731-6736, 2002. Semiclassical description of electron spin motion in radicals including the effect of electron hopping. Klaus Schulten and Peter G. Wolynes. Journal of Chemical Physics, 68:3292-3297, 1978. The coherent electron spin motion in radicals induced by the hyperfine coupling to nuclear spins is described semiclassically. The nuclear spins are treated as constant classical vectors around which the electron spin precesses. The ensemble average over all nuclear spin configurations is taken yielding the electron spin correlation tensor . Borrowing from the theory of rotational diffusion the effect of electron hopping between molecules on the spin correlation tensor is described. The treatment is applied to the time evolution of the electron spin state of a radical pair initially prepared in a singlet state. The low-lying electronic excitations in long polyenes: A PPP-MRD-CI study. Paul Tavan and Klaus Schulten. Journal of Chemical Physics, 85:6602-6609, 1986. A correct description of the electronic excitations in polyenes demands that electron correlation is accounted for correctly. Very large expansions are necessary including many electron configurations with at least one, two, three, and four electrons promoted from the Hartree-Fock ground state. The enormous size of such expansions had prohibited accurate computations of the spectra for polyenes with more than ten electrons. We present a multireference double excitation configuration interaction method (MRD-CI) which allows such computations for polyenes with up to electrons. We employ a Pariser-Parr-Pople (PPP) model Hamiltonian. For short polyenes with up to ten electrons our calculations reproduce the excitation energies resulting from full-CI calculations. We extend our calculations to study the low-lying electronic excitations of the longer polyenes, in particular, the gap between the first optically forbidden and the first optically allowed excited singlet state. The size of this gap is shown to depend strongly on the degree of bond alternation and on the dielectric shielding of the Coulomb repulsion between the electrons. Textbook: Neuronale Netze: Eine Einführung in die Neuroinformatik selbstorganisierender Abbildungen. Helge Ritter, Thomas Martinetz, and Klaus Schulten. Addison-Wesley, Bonn, second enlarged edition, 1990. Principal component analysis and long time protein dynamics. Manel A. Balsera, Willy Wriggers, Yoshitsugu Oono, and Klaus Schulten. 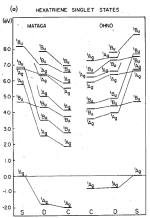 Journal of Physical Chemistry, 100:2567-2572, 1996. Magnetic field dependence of the geminate recombination of radical ion pairs in polar solvents. Klaus Schulten, H. Staerk, Albert Weller, Hans-Joachim Werner, and B. Nickel. Zeitschrift für Physikalische Chemie, NF101:371-390, 1976. We have previously demonstrated that a nanometer-diameter pore in. 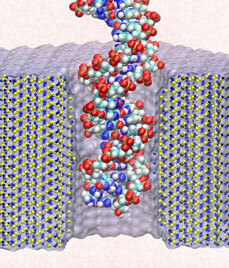 nanometer-thick MOS (Metal-Oxide-Semiconductor)-compatible membrane can be used as a molecular sensor for detecting DNA. The prospects for using this type of mechanism for sequencing DNA are avidly being pursued. The key attribute of the sensor is the electric field-induced (voltage-driven) translocation of the DNA molecule in an electrolytic solution across the membrane through the nanopore. To complement ongoing experimental studies developing such pores and measuring signals in response to the presence of DNA, we conducted molecular dynamics simulations of DNA translocation through the nanopore. A typical simulated system included a patch of a silicon nitride membrane dividing water solution of potassium chloride into two compartments connected by the nanopore. External electrical fields induced capturing of the DNA molecules by the pore from the solution and subsequent translocation. Molecular dynamics simulations suggest that 20 base pairs double stranded DNA can transit a nanopore of. 2.4 0.2 nm cross-section in a few microseconds at experimental fields. Hydrophobic interactions between DNA bases and the pore surface can slow down translocation of single stranded DNA and might favor unzipping of double stranded DNA inside the pore. DNA occluding the pore mouth blocks the electrolytic current through the pore; these curent blockades were found to have the same magnitude as the blockade observed when DNA transits the pore. All-atom molecular dynamics (MD) simulations of protein folding allow analysis of the folding process at an unprecedented level of detail. Unfortunately, such simulations have not yet reached their full potential both due to difficulties in sufficiently sampling the microsecond timescales needed for folding, and because the force field used may yield neither the correct dynamical sequence of events nor the folded structure. The ongoing study of protein folding through computational methods thus requires both improvements in the performance of molecular dynamics programs to make longer timescales accessible, and testing of force fields in the context of folding simulations. We report a ten-microsecond simulation of an incipient downhill-folding WW domain mutant along with measurement of a molecular time and activated folding time of 1.5 microseconds and 13.3 microseconds, respectively. The protein simulated in explicit solvent exhibits several metastable states with incorrect topology and does not assume the native state during the present simulations. Pigment organization and transfer of electronic excitation in the purple bacteria. Xiche Hu, Thorsten Ritz, Ana Damjanovic, and Klaus Schulten. Journal of Physical Chemistry B, 101:3854-3871, 1997. Absorption of light by light harvesting complexes and transfer of electronic excitation to the photosynthetic reaction center (RC) constitutes the primary light harvesting process of photosynthesis. This process is investigated on the basis of an atomic level structure of the so-called photosynthetic unit of the photosynthetic bacterium Rb. sphaeroides. The photosynthetic unit combines in the intracytoplasmic membrane a nanometric assembly of three protein complexes: (i) the photosynthetic reaction center, (ii) a ring-shaped light harvesting complex LH-I, and (iii) multiple copies of a similar complex, LH-II. The unit has been modeled using the known structure of (i) and for (ii) a model, recently obtained and complexed appropriately with (i); for (iii) the structure of LH-II of Rs. molischianum is substituted. The model describes in detail the organization of chromophores involved in primary light absorption and excitation transfer: a hierarchy of ring-shaped chlorophyll aggregates which surround four centrally located chlorophylls of the photosynthetic reaction center. The chlorophylls involved in the overall transfer are found in a co-planar arrangements. On the basis of the modeled structure a quantum-mechanical description of the entire light harvesting process is developed. For this purpose an effective Hamiltonian is established a priori and then employed to describe the LH-II LH-II LH-I RC cascade of excitation transfer. The transfer times calculated are in agreement with measured transfer times. The results suggest that excitons are the key carriers of the excitation transferred, i.e., electronic excitations are coherently delocalized in the photosynthetic unit. This suggestion is corroborated by an investigation of the effect of inhomogeneous broadening on the predicted excitons in LH-II and LH-I, and effect, which is found to be significant, but small. A particularly important role is played by the lowest energy excitons to which the circular arrangement of chlorophylls imparts vanishing oscillator strength. Despite the lack of oscillator strength the low energy excitons are well suited for exciton transfer on a sub-picosecond and picosecond time scale. The accessory chlorophylls of the photosynthetic reaction center are found to be critical for the LH-I RC transfer which would take several hundred picoseconds without these chlorophylls. Three-dimensional neural net for learning visuo-motor coordination of a robot arm. Thomas Martinetz, Helge Ritter, and Klaus Schulten. IEEE Transactions on Neural Networks, 1:131-136, 1990. An extension of Kohonen's self-organizing mapping algorithm together with an error-correction scheme based on the Widrow-Hoff learning rule is applied to develop a learning algorithm for the visuomotor coordination of a simulated robot arm. Learning occurs by a sequence of trial movements without the need of an external teacher. Using input signals from a pair of cameras, the"closed" robot arm system is able to reduce its positioning error to about 0.3 percent of the linear dimensions of its work space. This is achieved by choosing the connectivity of a 3D-lattice between the units of the neural net. We characterize the voltage-driven and voltage-free motion of single stranded DNA (ssDNA) molecules captured inside the 1.5 nm -Hemolysin pore, and show that the DNA-channel interactions depend strongly on the orientation of the ssDNA molecules with respect to the pore. Remarkably, the voltage free diffusion of the 3’ threaded DNA (in the trans to cis direction) is two times slower than the corresponding 5’ threaded DNA having the same poly(dA) sequence. Moreover, the ion currents flowing through the blocked pore with either a 3’ threaded DNA or 5’ DNA differ by approximately 30%. All-atom molecular dynamics simulations of our system reveal a microscopic mechanism for the asymmetric behavior. In a confining pore, the ssDNA straightens and its bases tilt toward the 5’ end, assuming an asymmetric conformation. As a result, the bases of a 5’-threaded DNA experience larger effective friction, and forced reorientation that favors co-passing of ions. Our results imply that the translocation process through a narrow pore is more complicated than previously believed and involves base tilting and stretching of ssDNA molecules inside the confining pore. Carbon nanotubes, unmodified (pristine) and modified through charged atoms, were simulated in water, and their water conduction rates determined. The conducted water inside the nanotubes was found to exhibit a strong ordering of its dipole moments. In pristine nanotubes the water dipoles adopt a single orientation along the tube axis with a low flipping rate between the two possible alignments. Modification can induce in nanotubes a bipolar ordering as previously observed in biological water channels. Network thermodynamics was applied to investigate proton conduction through the nanotubes. The key event in force-induced unfolding of titin's immunoglobulin domains. Hui Lu and Klaus Schulten. Biophysical Journal, 79:51-65, 2000. The function of membrane proteins often depends on the proteins interaction with their lipid environment, spectacularly so in the case of mechanosensitive channels, which are gated through tension mediated by the surrounding lipids. Lipid bilayer tension is distributed quite inhomogeneously, but neither the scale at which relevant variation takes place nor the effect of varying lipid composition or tension have yet been investigated in atomic detail. We calculated lateral pressure profile distributions in lipid bilayers of various composition from all-atom molecular dynamics simulations totaling 110.5 ns in length. Reproducible pressure profile features at the. length scale were determined. Lipids with PC headgroups were found to shift the lateral pressure out of the hydrophobic core and into the headgroup region by an amount that is independent of area per lipid. POPE bilayers simulated at areas smaller than optimal exerted dramatically higher lateral pressure in a narrow region at the start of the aliphatic chain. Stretching of POPC bilayers increased tension predominantly in the same region. A simple geometric analysis for the gating of the mechanosensitive channel MscL suggests that pressure profiles affect its gating through the second moment of the profile in a tension independent manner. The tenth type III module of fibronectin, , mediates cell adhesion to surfaces. 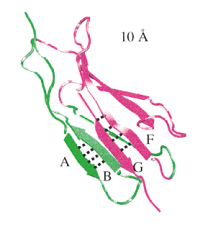 It posesses a -sandwich structure containing seven -strands (A through G) that are arranged in two anti-parallel sheets where the cell binding motif, Arg78-Gly79-Asp80 (RGD), is placed at the apex of the loop connecting -strands F and G. Steered molecular dynamics (SMD) simulations in which tension is applied to the protein's terminal ends reveal that the module can act as a tensile molecular recognition switch. Analysis of the forced unfolding process of shows that the G-strand is the first to be released while the remaining module maintains its structural integrity. This leads to a gradual shortening of the distance between the apex of the RGD-containing loop and th surface of the remaining module followed by a straightening of this loop from a -turn into a linear conformation. Experimental data have previously shown that shortening the RGD-containing loop reduces its accessibility to membrane-bound integrins, and that the loop's affinity and selectivity to integrins decreases when linearized. A principle for the formation of the spatial structure of cortical feature maps. Klaus Obermayer, Helge Ritter, and Klaus Schulten. Proceedings of the National Academy of Sciences, USA, 87:8345-8349, 1990. Orientation-selective cells in the striate cortex of higher animals are organized as a hierarchical topographic map of two stimulus features: (i) position in visual space and (ii) orientation. We show that the observed structure of the topographic map can arise from a principle of continuous mapping. For the realization of this principle we use a mathematical model that can be interpreted as an adaptive process changing a set of synaptic weights, or synaptic connection strengths, between two layers of cells. The patterns of orientation preference and selectivity generated by the model are similar to the patterns seen in the visual cortex of macaque monkey and cat and correspond to a neural projection that maps a more than two-dimensional feature space onto a two-dimensional cortical surface under the constraint that shape and position of the receptive fields of the neurons vary smoothly over the cortical surface. Steered molecular dynamics investigations of protein function. Barry Isralewitz, Jerome Baudry, Justin Gullingsrud, Dorina Kosztin, and Klaus Schulten. 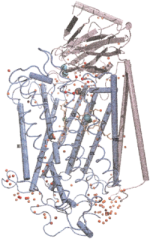 Journal of Molecular Graphics and Modeling, 19:13-25, 2001. Molecular recognition and mechanical properties of proteins govern molecular processes in the cell that can cause disease and can be targeted for drug design. Single molecule measurement techniques have greatly advanced knowledge but cannot resolve enough detail to be interpreted in terms of protein structure. We seek to complement, therefore, the observations through so-called Steered Molecular Dynamics (SMD) simulations that on the one hand link directly to experiments and and the other hand provide atomic level descriptions of the underlying events. Such a research program has been initiated in our group and has involved, for example, studies of elastic properties of immunoglobulin and fibronectin domains as well as the binding of biotin and avidin. In this article, we explain the SMD method and suggest how it can be applied to the function of three systems that are the focus of modern molecular biology research, force transduction by the muscle protein titin and extracellular matrix protein fibronectin, recognition of antibody-antigene pairs, and ion selective conductivity of the K+ channel. Specialized molecular aggregates in purple bacteria exploit subtle quantum physics to collect and convert light energy for photosynthesis. Myoglobin (Mb) is perhaps the most studied protein, experimentally and theoretically. Despite the wealth of known details regarding the gas migration processes inside Mb, there exists no fully conclusive picture of these pathways. We address this deficiency by presenting a complete map of all the gas migration pathways inside Mb for small gas ligands (O2, NO, CO, and Xe). To accomplish this, we introduce a computational approach for studying gas migration, which we call implicit ligand sampling. Rather than simulating actual gas migration events, we infer the location of gas migration pathways based on a free-energy perturbation approach applied to simulations of Mb's dynamical fluctuations at equilibrium in the absence of ligand. The method provides complete three-dimensional maps of the potential of mean force of gas ligand placement anywhere inside a protein-solvent system. From such free-energy maps we identify each gas docking site, the pathways between these sites, to the heme and to the external solution. Our maps match previously known features of these pathways in Mb, but also point to the existence of additional exits from the protein matrix in regions that are not easily probed by experiment. We also compare the pathway maps of Mb for different gas ligands and for different animal species. Oxygen and proton pathways in cytochrome c oxidase. Ivo Hofacker and Klaus Schulten. 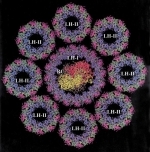 PROTEINS: Structure, Function, and Genetics, 30:100-107, 1998. Background: Cytochrome c oxidase is a redox-driven proton pump, which couples the reduction of oxygen to water to the translocation of protons across the membrane. The recently solved x-ray structures of cytochrome c oxidase permit molecular dynamics simulations of the underlying transport processes. To eventually establish the proton pump mechanism we investigate the transport of the substrates, oxygen and protons, through the enzyme. Results: Molecular dynamics simulations of oxygen diffusion through the protein reveal a pathway to the oxygen binding site starting at a hydrophobic cavity near the membrane exposed surface of subunit I, close to the interface to subunit III. A large number of water sites is predicted within the protein. The water molecules form two channels along which protons can enter from the cytoplasmic (matrix) side of the protein and reach the binuclear center. Conclusions: Oxygen is channeled to the catalytic center of the enzyme along a well defined path. Hydrophobic cavities at the start of the path could serve as reservoirs for oxygen. 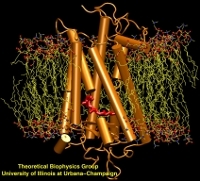 Water might play an essential role for the transfer of protons in cytochrome c oxidase. A possible pumping mechanism is proposed that involves a shuttling motion of a glutamic acid side chain, which could then transfer a proton to a propionate group of heme . Protein domain movements: Detection of rigid domains and visualization of hinges in comparisons of atomic coordinates. Willy Wriggers and Klaus Schulten. PROTEINS: Structure, Function, and Genetics, 29:1-14, 1997. 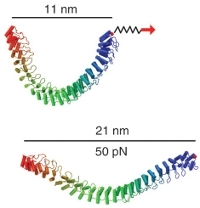 The activity of many proteins induces conformational transitions by hinge-bending, which involves the movement of relatively rigid parts of a protein about flexible joints. We present an algorithm to identify and visualize the movements of rigid domains about common hinges in proteins. In comparing two structures, the method partitions a protein into domains of preserved geometry. The domains are extracted by an adaptive selection procedure using least-squares fitting. The user can maintain the spatial connectivity of the domains and filter significant structural differences (domain movements) from noise in the compared sets of atomic coordinates. The algorithm subsequently characterizes the relative movements of the found domains by effective rotation-axes (hinges). The method is applied to several known instances of domain movements in protein structures, namely, in lactoferrin, hexokinase, actin, the extracellular domains of human tissue factor, and of the receptor of human growth factor. The results are visualized with the molecular graphics package VMD (Humphrey et al., J. Mol. Graphics 14(1):33-38, 1996). Applications of the algorithm to the analysis of conformational changes in proteins and to biomolecular docking are discussed. Theory and simulation of water permeation in aquaporin-1. Fangqiang Zhu, Emad Tajkhorshid, and Klaus Schulten. Biophysical Journal, 86:50-57, 2004. The paper starts with a detailed discussion of the difference between osmotic permeability and diffusion permeability of single- file water channels, demonstrating that the ratio corresponds to the number of effective steps a water molecule needs to take to permeate the channel. While can be directly obtained from equilibrium molecular dynamics simulations, must be determined from simulations in which a chemical potential difference of water has been established on the two sides of the channel. In light of this, we suggest here a method to induce in molecular dynamics simulations a hydrostatic pressure difference across the membrane, from which can be measured. Simulations using this method are performed on aquaporin-1 channels in a lipid bilayer, resulting in a calculated of 7.1 10 cm /s, which is in close agreement with observation. Using a previously determined value, we conclude that for aquaporin-1 measures about 12. This number is explained in terms of channel architecture and conduction mechanism. Excitons in a photosynthetic light-harvesting system: A combined molecular dynamics, quantum chemistry and polaron model study. Ana Damjanovic, Ioan Kosztin, Ulrich Kleinekathoefer, and Klaus Schulten. Physical Review E, 65:031919, 2002. The dynamics of pigment-pigment and pigment-protein interactions in light-harvesting complexes is studied with a novel approach that combines molecular dynamics simulations with quantum chemistry calculations and a polaron model analysis. The molecular dynamics simulation of light-harvesting complexes was performed on an 87,055 atom system comprised of an LH-II complex of Rhodospirillum molischianum embedded in a lipid bilayer and surrounded with appropriate water layers. For each of the 16 B850 BChls we performed 400 ab initio quantum chemistry calculations on geometries that emerged from the molecular dynamical simulations, determining the fluctuations of pigment excitation energies as a function of time. From the results of these calculations we construct a time-dependent Hamiltonian of the B850 exciton system from which we determine within linear response theory the absorption spectrum. Finally, a polaron model is introduced to describe both the excitonic and coupled phonon degrees of freedom by quantum mechanics. The exciton-phonon coupling that enters into the polaron model, and the corresponding phonon spectral function are derived from the molecular dynamics and quantum chemistry simulations. The model predicts that excitons in the B850 BChl ring are delocalized over five pigments at room temperature. Also, the polaron model permits the calculation of the absorption and circular dichroism spectra of the B850 excitons from the sole knowledge of the autocorrelation function of the excitation energies of individual BChls, which is readily available from the combined molecular dynamics and quantum chemistry simulations. The obtained results are found to be in good agreement with the experimentally measured absorption and circular dichroism spectra. Statistical-mechanical analysis of self-organization and pattern formation during the development of visual maps. Klaus Obermayer, Gary G. Blasdel, and Klaus Schulten. Physical Review A, 45:7568-7589, 1992. 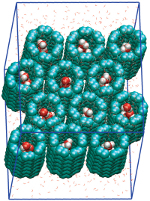 Pressure-induced water transport in membrane channels studied by molecular dynamics. Fangqiang Zhu, Emad Tajkhorshid, and Klaus Schulten. Biophysical Journal, 83:154-160, 2002. A method is proposed to measure the water permeability of membrane channels by means of molecular dynamics simulations. By applying a constant force to the bulk water molecules and a counter force on the complementary system, a hydrostatic pressure difference across the membrane can be established, producing a net directional water flow. The hydraulic or osmotic permeability can then be determined by the ratio of the water flux and the pressure difference. The method is applied and tested on an aquaglyceroporin channel through a series of simulations totaling 5 ns in duration. A mechanism for the light-driven proton pump of Halobacterium halobium. Klaus Schulten and Paul Tavan. Nature, 272:85-86, 1978. Mitchell's hypothesis of chemiosmotic coupling between redox reactions and ATP synthesis in membranes is supported by the finding of a light-driven proton pump in the purple membrane of Halobacterium halobium. 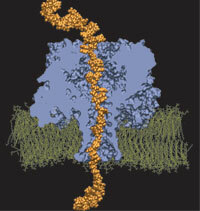 The purple membrane contains the protein bacteriorhodopsin in a crystalline array, with retinal as a chromophore. We propose here, on the basis of quantumchemical arguments and experimental observations, that the H. halobium proton pump may involve proton translocation through photoisomerisation of retinal about its 14-15 single bond. Steered molecular dynamics simulations of force-induced protein domain unfolding. Hui Lu and Klaus Schulten. 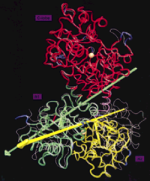 PROTEINS: Structure, Function, and Genetics, 35:453-463, 1999. A perspective of biomolecular simulations today is given, with illustrative applications and an emphasis on algorithmic challenges, as reflected by the work of a multidisciplinary team of investigators from five institutions. Included are overviews and recent descriptions of algorithmic work in long-time integration for molecular dynamics, fast electrostatic evaluations, crystallographic refinement approaches, and implementaiton of large, computer-intensive programs on modern architectures. Steered molecular dynamics (SMD) induces unbinding of ligands and conformational changes in biomolecules on time scales accessible to molecular dynamics simulations. Time-dependent external forces are applied to a system, and the responses of the system are analyzed. SMD has already provided important qualitative insights into biologically relevant problems, as demonstrated here for applications ranging from identification of ligand binding pathways to explanation of elastic properties of proteins. First attempts to deduce potentials of mean force by discounting irreversible work performed on the system are summarized. The non-equilibrium statistical mechanics underlying analysis of SMD data is outlined. Accelerated molecular dynamics simulation with the parallel fast multipole algorithm. John A. Board, Jr., J. W. Causey, James F. Leathrum, Jr., Andreas Windemuth, and Klaus Schulten. Chemical Physics Letters, 198:89-94, 1992. We have implemented the fast multipole algorithm (FMA) of Greengard and Rokhlin and incorporated it into the molecular dynamics program MD of Windemuth and Schulten, allowing rapid computation of the non-bonded forces acting in dynamical protein systems without truncation or other corruption of the Coulomb force. The resulting program speeds up simulations of protein systems with approximately 24000 atoms by up to an order of magnitude on a single workstation. Additionally, we have implemented a parallel version of the three-dimensional FMA code on a loosely coupled network of workstations, further reducing simulation times. Large (in both size of system and length of simulated time) protein molecular dynamics simulations are now possible on workstations rather than supercomputers, and very large protein computations are possible on clusters of workstations and parallel machines. We have explored the electromechanical properties of DNA on a nanometer-length scale using an electric field to force single molecules through synthetic nanopores in ultra-thin silicon nitride membranes. At low electric fields E <200mV/10nm, we observed that single stranded DNA can permeate pores with a diameter 1.0nm, while double stranded DNA only permeates pores with a diameter 3nm. For pores < 3.0nm-diameter, we find a threshold for permeation of double stranded DNA that depends on the electric field and pH. For a 2nm-diameter pore, the electric field threshold is about 3.1V/10nm at pH=8.5; the threshold decreases as pH becomes more acidic or the diameter increases. Molecular dynamics indicates that the field threshold originates from a stretching transition in DNA that occurs under the force gradient in a nanopore. Lowering pH destabilizes the double helix, facilitating DNA translocation at lower fields. We present a two-layered network of linear neurons that organizes itself as to extract the complete information contained in a set of presented patterns. The weights between layers obey. Hebbian rule. We propose a local anti-Hebbian rule for lateral, hierarchically organized weights within the output layer. This rule forces the activities of the output units to become uncorrelated and the lateral weights to vanish. The weights between layers converge to the eigenvectors of the covariance matrix of input patterns, i.e., the network performs a principal component analysis, yielding all principal components. As a consequence of the proposed learning scheme, the output units become detectors of orthogonal features, similar to ones found in the brain of mammals. 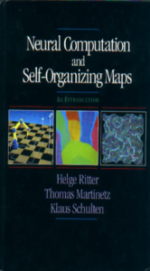 Kohonen's self-organizing maps: Exploring their computational capabilities. Helge Ritter and Klaus Schulten. In IEEE International Conference on Neural Networks, San Diego, California, July 24-27, 1988, volume 1, pp. 109-116, New York, 1988. The Institute of Electrical and Electronics Engineers. It is demonstrated that the computational capabilities of Kohonen's self-organizing mapping algorithm can be applied to problems from such diverse fields as sensory mappings, combinatorial optimization and motor control. In addition we present some recent mathematical results characterizing important properties of the algorithm in these situations. Retinal cis-trans isomerization and early relaxation steps have been studied in a 10ns molecular dynamics simulation of a fully hydrated model of membrane-embedded rhodopsin. The isomerization, induced by transiently switching the potential energy function governing the C =C dihedral angle of retinal, completes within 150fs and yields a strongly distorted retinal. The most significant conformational changes in the binding pocket are straightening of retinal's polyene chain and separation of its -ionone ring from Trp265. 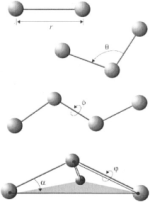 In the following 500ps, transition of 6s-cis to 6s-trans retinal and dramatic changes in the hydrogen bonding network of the binding pocket involving the counterion for the protonated Schiff base, Glu113, occur. Furthermore, the energy initially stored internally in the distorted retinal is transformed into non-bonding interactions of retinal with its environment. 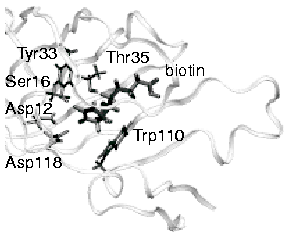 During the following ten nanoseconds, increased mobilities of some parts of the protein, such as the kinked regions of the helices, mainly helix VI, and the intracellular loop I2, were observed, as well as transient structural changes involving the conserved salt bridge between Glu134 and Arg135. These features prepare the protein for major structural transformations achieved later in the photocycle. Retinal's motion, in particular, can be compared to an opening turnstile freeing the way for the proposed rotation of helix VI. This was demonstrated by a steered molecular dynamics simulation in which an applied torque enforced the rotation of helix VI. In photosynthetic light harvesting systems carotenoids and chlorophylls jointly absorb light and transform its energy within about a picosecond into electronic singlet excitations of the chlorophylls only. This paper investigates this process for the light harvesting complex II of the purple bacterium Rs. molischianum, for which a structure and, hence, the exact arrangement of the participating chlorophylls and carotenoids have recently become known. Based on this structure and on CI expansions of the electronic states of individual chromophores (chlorophylls and carotenoids) as well as on an exciton description of a circular aggregate of chlorophylls, the excitation transfer between carotenoids and chlorophylls is described by means of Fermi's golden rule. The electronic coupling between the various electronic excitations is determined for all orders of multipoles (generalized Förster mechanism) and includes the electron exchange (dexter mechanism) term. The rates and efficiencies for different pathways of excitation transfer, e.g., (carotenoid) chlorophyll aggregate and (carotenoid) chlorophyll aggregate, are compared. The results show that in LH-II the generalized Förster mechanism is dominant for the transfer of singlet excitations and that exciton splitting of chlorophyll excitations plays a crucial role in accelerating the lycopene chlorophyll excitation transfer. Photoprotection of chlorophylls through triplet quenching is investigated, too. The results suggest that eight of the 24 chlorophylls in LH-II of Rs. molischianum are protected well by eight carotenoids observed in the X-ray structure of the protein, but that the remaining chlorophylls are protected by eight further carotenoids which are known to be bound to the protein, but have not yet been resolved in an X-ray structure. Self-organizing maps: Stationary states, metastability and convergence rate. Edgar Erwin, Klaus Obermayer, and Klaus Schulten. Biological Cybernetics, 67:35-45, 1992. We investigate the effect of various types of neighborhood function on the convergence rates and the presence or absence of metastable stationary states of Kohonen's self-organizing feature map algorithm in one dimension. We demonstrate that the time necessary to form a topographic representation of the unit interval [0,1] may vary over several orders of magnitude depending on the range and also the shape of the neighborhood function, by which the weight changes of the neurons in the neighborhood of the winning neuron are scaled. We will prove that for neighborhood functions which are convex on an interval given by the length of the Kohonen chain there exist no metastable states. For all other neighborhood functions, metastable states are present and may trap the algorithm during the learning process. For the widely-used Gaussian function there exists a threshold for the width above which metastable states cannot exist. Due to the presence or absence of metastable states, convergence time is very sensitive to slight changes in the shape of the neighborhood function. Fastest convergence is achieved using neighborhood functions which are "convex" over a large range around the winner neuron and yet have large differences in value at neighboring neurons. Fibronectin (FN) forms fibrillar networks coupling cells to the extracellular matrix (ECM). The formation of FN fibrils, fibrillogenesis, is a tightly regulated process involving the exposure of cryptic binding sites in individual FN type III (FN-III) repeats presumably exposed by mechanical tension. The FN-III1 module has been previously proposed to contain such cryptic sites that promote the assembly of extracellular matrix FN fibrils. We have combined NMR and steered molecular dynamics (SMD) simulations to study the structure and mechanical unfolding pathway of FN-III1. This study finds that FN-III1 consists of a beta-sandwich structure that unfolds to a mechanically stable intermediate which is about four times the length of the native folded state. Considering previous experimental findings, our studies provide a structural model by which mechanical stretching of FN-III1 may induce fibrillogenesis through this partially unfolded intermediate. Molecular dynamics simulations of proteins in lipid bilayers. James Gumbart, Yi Wang, Alekseij Aksimentiev, Emad Tajkhorshid, and Klaus Schulten. Current Opinion in Structural Biology, 15:423-431, 2005. With recent advances in X-ray crystallography of membrane proteins promising many new high-resolution structures, MD simulations become increasingly valuable for understanding membrane protein function, as they can unleash dynamic behavior concealed in the static structures. Dramatic increase in computational power in synergy with more efficient computational methodologies allows one today to carry out molecular dynamics simulations of any structurally known membrane protein in its native environment, covering the time scale of up to 0.1 sec. At the frontier of membrane protein simulations are ion channels, aquaporins, passive and active transporters, and bioenergetic proteins. In this review we summarize recent developments in this rapidly evolving field. Neural network control of a pneumatic robot arm. Ted Hesselroth, Kakali Sarkar, P. Patrick van der Smagt, and Klaus Schulten. IEEE Transactions on Systems, Man, and Cybernetics, 24:28-37, 1994. A neural map algorithm has been employed to control a five-joint pneumatic robot arm and gripper through feedback from two video cameras. The pneumatically driven robot arm (SoftArm) employed in this investigation shares essential mechanical characteristics with skeletal muscle systems. To control the position of the arm, 200 neurons formed a network representing the three-dimensional workspace embedded in a four-dimensional system of coordinates from the two cameras, and learned a three-dimensional set of pressures corresponding to the end effector positions, as well as a set of 3 4 Jacobian matrices for interpolating between these positions. The gripper orientation was achieved through adaptation of a 1 4 Jacobian matrix for a fourth joint. Because of the properties of the rubber-tube actuators of the SoftArm, the position as a function of supplied pressure is nonlinear, nonseparable, and exhibits hysteresis. 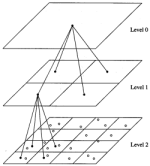 Nevertheless, through the neural network learning algorithm the position could be controlled to an accuracy of about one pixel ( 3 mm) after 200 learning steps and the orientation could be controlled to two pixels after 800 learning steps. This was achieved through employment of a linear correction algorithm using the Jacobian matrices mentioned above. Applications of repeated corrections in each positioning and grasping step leads to a very robust control algorithm since the Jacobians learned by the network have to satisfy the weak requirement that the Jacobian yields a reduction of the distance between gripper and target. The neural network employed in the control of the SoftArm bears close analogies to a network which successfully models visual brain maps. It is concluded, therefore, from this fact and from the close analogy between the SoftArm and natural muscle systems that the successful solution of the control problem has implications for biological visuo-motor control. The mechanosensitive channel of large conductance (MscL) in prokaryotes plays a crucial role in exocytosis as well as in the response to osmotic downshock. 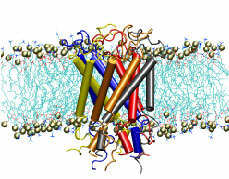 The channel can be gated by tension in the membrane bilayer. 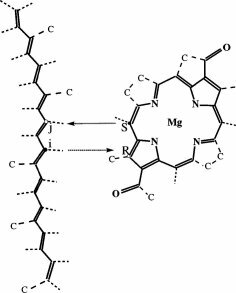 The determination of functionally important residues in MscL, patch-clamp studies of pressure-conductance relationships, and the recently elucidated crystal structure of MscL from Mycobaterium tuberculosis, have guided the search for the mechanism of MscL gating. Here, we present a molecular dynamics study of the MscL protein embedded in a fully hydrated POPC bilayer. Simulations totalling 3 ns in length were carried out under conditions of constant temperature and pressure using periodic boundary conditions and full electrostatics. The protein remained in the closed state corresponding to the crystal structure, as evidenced by its impermeability to water.. Analysis of equilibrium fluctuations showed that the protein was most immobile in the narrowest part of the channel. The gating process was investigated through simulations of the bare protein under conditions of constant surface tension. Under a range of conditions the transmembrane helices flattened as the pore widened. Implications for the gating mechanism in light of these and experimental results are discussed. Contact Us // Material on this page is copyrighted; contact Webmaster for more information. // Document last modified on 02 Dec 2016 // 84983 accesses since 28 Aug 2008 .